Family Volley: Naptime a Nightmare? Babies need naps, and babies that have good nap habits have better nighttime sleep habits. They go hand in hand. Children crave consistency. It is important to set a routine early, from birth, to help set the stage for years of good sleeping. Under 3 Months. Newborns don't have working internal clocks yet. It isn't until they are between 6-10 weeks old, that they straighten out their days and nights. You want to start setting up their schedule by not letting them stay up for more than two hours at a time. 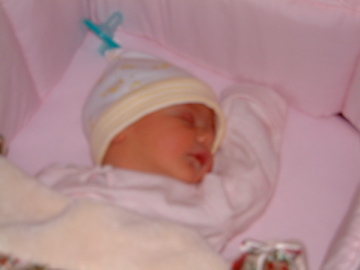 For most newborns, two hours is too long. Look for the typical tired signs and admonish them. Newborns are really good at sleep. They don't need any special accommodations. They will fall asleep any where, any time. It is tempting to want to always hold them while they sleep, or leave them in a car seat, swing or bouncer. Regardless, it is still important to put them down to nap in their bed. The same place you have them sleep at night. Set the stage for sleep: quiet, dim/dark, so they begin to make "sleep associations". Between 3 and 6 Months. Babies during these months usually take 3 naps a day. You will most likely see a pattern developing with your babies sleep habits during the day. If you don't, you need to establish one (if you haven't already). It is important to have your child nap at the same times every day so that their internal clock becomes programmed. When a baby misses their sleep window their body actually fights against itself and makes it harder to fall asleep. Boy, have I experienced this with our children. If I miss the "tired window", it is all over. How do you set up a Nap Routine? First nap of the day, put your baby in bed AWAKE (drowsy), just like you should do at night to go to bed. Hopefully your baby will fall asleep on their own. BUT, given that that rarely happens and there will be some crying: go back in at regular intervals. 5, 10 or 15 minute intervals depending on how severe the crying is and how comfortable you are listening to it. When you go in, keep your words to a minimum. A simple sentence of reassurance like "I love you" is perfect. Then, leave the room. Refrain from touching, coddling, etc... Continue the routine for an hour. If they still have not fallen asleep, pick them up. Give them an hour and a half to two hours and TRY AGAIN. Don't give up. Falls asleep but wakes up 15 minutes later. Don't give up. Ideally you want your babies to sleep for at least 45 minutes. If they wake up after 15, don't assume the nap is over. A cat nap just takes the edge off for your baby. It doesn't give them enough to sustain them. If your baby wakes up "early" let them be. Try to not take them out of their bed for a full hour even if they are awake. 6-9 Months. There is a misnomer. Parents think that if you keep kids up later, they will sleep longer in the morning. It is also easy to think that if we keep kids up all day without naps, that they will sleep better and longer at night. NOT TRUE. SLEEP ACTUALLY BEGETS SLEEP. Kids who nap during the day will sleep better at night. Kids who sleep well at night will take better naps. During these months babies routines will start to change. Two hours between naps is usually too short. Now it will be closer to three, so babies will start to take two naps instead of three. This usually happens closer to 9 months than 6. Every child is different so if you have a tired child every two hours, put them down to sleep. Babies usually make this clear. With our kids, when I try for the third nap, they just sit in bed and play so I know it is time to make a change. Even though they don't go to sleep, I still use the third nap as quiet time. 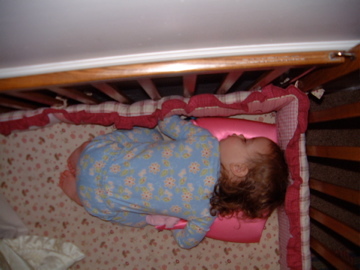 If your baby is struggling with naps you should evaluate how they are sleeping at night. Do they stay up too late? Do you wait until they fall asleep somewhere on their own? An over tired baby has a harder time falling asleep and staying asleep. 20-24 Months. 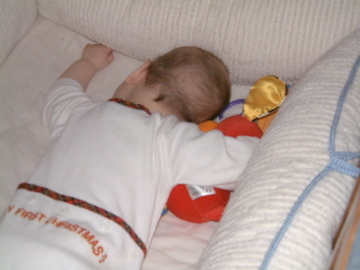 Around two years old, babies might start to phase out their morning nap (go from 2 naps to 1). This will depend on the child, but it can also depend on how willing parents are to keep the routine going. Keep at it. Don't give up on naps. Kids will often go through spells where they fight against them or appear to have grown out of them. Give them quiet time, allow them to sit and read or just rest in bed. If they are under 3 they still need one nap a day. Keep to the schedule. We are huge advocates of naps in our house. That said, it is not always easy. Sticking to the schedule, enforcing the schedule on the days when no one is cooperating can be really frustrating. It has been worth all the effort. I have to structure my day and errands and appointments around when the kids need naps. And although it takes more on my part, a happy child is totally worth it. You will find that a nap schedule brings predictability and security to your children. It will also even their temperament and make them happier. Making you happier. Have you had success with naps? I love this. I am expecting our first child soon & have heard so many things - back & forth - about breastfeeding, napping/sleep scheduling, etc., and it's nice to hear some common sense! Thank you. My Mother never had me on a regular nap schedule growing up, so whenever I spent time at my Aunt's I would resist nap time, but after the fight, I always woke feeling much better. There is a lot of info out there. So glad the common sense helped. You have inspired me. I think I will nap today. great tips! my baby sleeps really well, luckily. but i need to be better at coming up with a sleep routine and putting him in his bed for naps. i never do that. I love naps. And love that my 2 1/2 yr old still naps. I read a book that talked about baby's needing to sleep every 2 hours. It was amazing what that did and I only wish I had known that with my first child. The poor girl was so sleep deprived. My tip is to get them to fall asleep on their own. I've never been good with that, and it's not fun.